Contents: 274 parts including 12 mini-figs, 5 soccer balls, and a fully playable game! The action was fast and furious down on the pitch. Neither team had caught a break yet and the score remained deadlocked at 0-0. Steve Douglas from the visiting team caught a quick centering pass from one of his midfielders and took the shot from 20 feet out. The keeper saw it coming, though, and effortlessly made the save. The home team took control on a fantastic header and Mike Aster chipped it to the current scoring leader, Greg Dempsey. Greg faked right and launched a fantastic shot toward goal. The goaltender lept out to save it but could only look helplessly as the ball flew past his outstretched fingertips. GOAL!! The home team jumped and celebrated as the crowd roared and cheered. 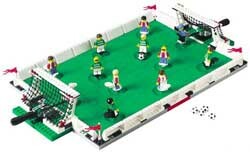 This set is playing field for the new Lego soccer game. It works tremendously well, and playing it is great fun for two or more people. The field is set up for a 6 on 6 game, and uses special spring-mounted stands for your minifigs. These are actually quite well thought out. There is a slight circular indentation around each base which is used for the player stand to rotate the ball around. This makes it very easy to line up a shot or pass exactly where you want it. It takes a little while to figure out how hard to pull back to make a pass, but the spring is tight enough to allow for a long, fast shot when pulled back all the way. The keeper is mounted on an wand that can be rotated left and right to cover the goal, as well as pivoted to turn your keeper for maximum reach. A rubber ring keeps enough tension on it to return it to a nice centering position when you release control. It also allows for nice goal kicks. The mini-figs are preprinted with team shirts (green and white or red and blue) and numbers on the back. The shirts I can live with, although it would have been nice to keep them blank for country stickers like they did with the team busses. The preprinted numbers create a problem because you can't add extra players from another set without having them have the same number. A bit nitpicky, but it doesn't fit in with the scheme I was trying to create. One player for each team has a headband printed on the face and does not come with hair. I thought this was a great idea. There has been some discussion about this, but in the US you also get a set of female heads and hair to create women's teams if you wish. Call it political correctness if you want, but I call it value and a nice addition. The field is configured of special plates that interlock with green 2 x 2 flats to create the smooth pitch. They are configurable in a way and you can change the position of the players by moving the plates around. You will want some extra bricks to reinforce the bottom (not included) and add strength. I found out about this on the official Lego soccer page and it is a point well taken. The goals are fitted separately on the ends and are nicely put together to allow good keeper movement and the net to trap the ball. The border around the field is made of special pieces that look very much like to advertising boards found on professional soccer fields. They also include a sheet of stickers to create your own advertising. This is a nice look, but makes the whole field take on the look of an indoor field rather than an outdoor field. This set is also expandable using pieces from other sets. There is a set specifically with additional parts for the field (3410) and you can use parts from the Shoot n' Score (3401) to add to it. The instruction book shows how you can use these additional parts, as well as showing how you can use the parts with the set to make skill challenges and an obstacle course for the soccer players. This is a very nice addition. This set may offend Lego purists. It is very much intended to be a game. You build it, and maybe expand it a little, but mostly you are going to want to play it and not think much about it being Lego. There really isn't anything else you can do with this set besides make some sort of soccer game out of it. This doesn't bother me as it is just too fun to think poorly of. My only real complaint is that it does not really fit into a town layout like the World Cup sets do. It is a full block high all the way around, which makes it difficult for other sets around it to look right. This set is the prime example of what Lego should be doing to attract young collectors rather than shoving juniorized sets at them. I want to rate this set 5 stars very badly, but its lack of real Lego usefulness in buiding not related to soccer keeps me from it. As a game, it gets my highest recommendation. 59 readers have rated this set as 4.285 out of 5 stars.